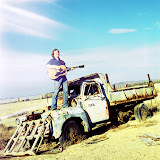 On Sunday we were off to the Salton Sea to film the video for the first single off my new record... Pink Champagne. I think you're gonna love it. Thanks to all who came to help with the video. Our intrepid crew: Nick Prevas, director (pulling double-duty) Caitlin Dahl, Hannah Hall and Tanner. As well as the band members: Steve Tegel, Dutchy, Paxton, Emily on keys, Melinda Dahl doing double duty as our photographer and back up singer. It was a long productive day. The video and 1st single should be ready for purchase some time in the next 2 months! Here are some behind the scenes shots. I've kept back the money shots so you'll get to see them in the video first. Enjoy! i found your blog! can't wait to see the video!~!